The Australian government says it will introduce stricter criminal penalties in response to a fruit contamination scare that has alarmed the country. 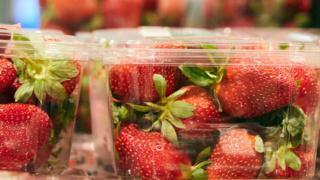 Authorities are investigating more than 100 reports of people finding needles concealed within strawberries and other fruits since last week, officials said. Prime Minister Scott Morrison said culprits could face 15-year jail terms. A young person has been arrested after admitting putting needles in the fruit as a copycat prank, police said. The child would be "dealt with under the youth cautioning system," New South Wales Acting Assistant Commissioner Stuart Smith said. "That's how seriously our government takes it," he said, urging parliament to pass the new laws this week. Currently, the maximum sentence for contaminating food is 10 years. The Labor opposition said it would support the change. Mr Morrison said the new legislation would also target those behind copycat and hoax incidents. "You are putting the livelihoods of hard-working Australians at risk, and you are scaring children," Mr Morrison said. "And you are a coward and a grub." Three states have offered A$100,000 rewards for information, as police continue to investigate the cause of the sabotage. In Queensland, where cases were first reported, police have said they are focusing on complicated food supply chains. The scare has prompted product recalls, forcing some growers in the A$130m annual industry to destroy their crops. Exporters have been ordered to undergo tighter checks, including mandatory screening of produce through metal detectors or X-ray machines. The government has urged consumers to continue purchasing strawberries, but to cut them up before consumption.